One of the oldest paper crafts is quilling, also known as paper filigree. 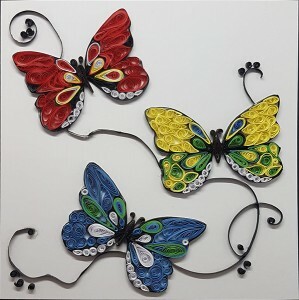 Quilling, also known as paper filigree, is the art of cutting and curling narrow strips of paper and laying them on edge to form intricate filigree designs. The process, which dates back to at least the 13th Century, originated with religious orders who used the gilded edges of old manuscripts to decorate religious artifacts. It is believed the paper was curled around the base of a quill (or feather), hence the name quilling. It was popular with genteel ladies of the Georgian and Regency period and was used to decorate all sorts of items and even furniture. Cabinet makers would produce boxes with recessed panels ready for paper filigree decoration and it was taught in the best ladies boarding schools alongside needlework. Young ladies needed something to occupy their time while they waited for their future husband to come along. It's a very simple craft, you just need thin strips of lightweight paper and a little glue. You can cut strips of paper yourself and the strips can be rolled between finger and thumb, but it's a lot easier with a few tools. Which we have in stock. A Quilling Tool is a slotted tool which makes it easier to curl the paper. The Quilling Board has cut-out shapes of different sizes in which the coils are placed in the desired shape and allowed to 'rest' so that they hold their shape. You can then gently pinch and work them into the desired shape - teardrop, leaf, crescent, square, arrow, rectangle and so many more. Use a glue with a fine applicator nozzle or apply the glue with a cocktail stick. It's important to be sparing with the glue and tweezers are useful to hold the shapes and put them in place. Are the March winds coming all at once? First Freya and now Gareth. It's quite a battering but so far no damage here. Hope that's the same for you. The Crystal Card Kits continue to be very popular so we've added more designs to the website. Including some 'magical' ones: a Unicorn, Flamingoes, Mermaid and a rather chilled-out Dragon. New to the website are Templates from Dolly Dimples. We have a full set of A5 Letters, a template for a ladies shoe and two templates for cute figures with movable arms and legs. The templates are printed on card so can be used again and again. 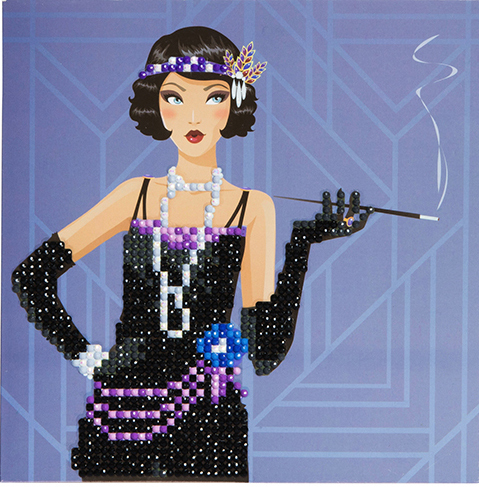 We have some new dies from Sizzix including something rather different. GeoSpringtime is a set of three dies, a bird, butterfly and rabbit in very angular, geometric designs. My first thoughts were men's cards, which are always something of a challenge. But they also make me think of stained glass, cut glass, steampunk and even origami. 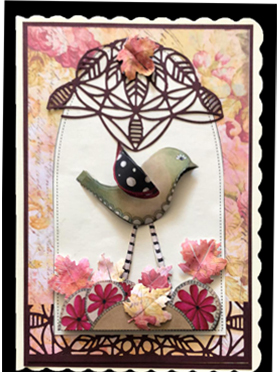 Cut Out Blossoms is a different take on die cutting. 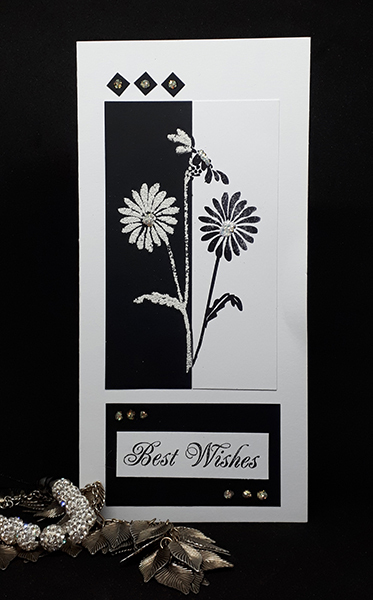 Rather than cutting out a flower which then gets glued onto the card, these dies cut the detail of the flower into the cardstock. Oh, and three dinosaurs from Sizzix. The dies have separate cut-outs for the legs which can be decoupaged or attached with small brads so the legs can move. One of my aims for this year is to get out more, to craft shows that is. I just love meeting people and chatting about crafting, or anything really. On Sunday I set up at the Gravesend Borough Market with a selection of our stock and a mini Make and Take. I enjoyed it so much, I'm going back for the next two Saturdays. It's very relaxing. The kits contain everything you need and you just lift up each gem with the sticky tool provided and press it onto the picture on the card. Simple as that. The gems are faceted so pick up the light and sparkle! 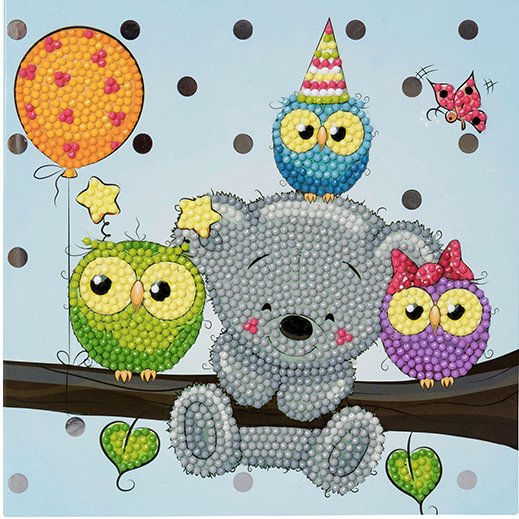 We also have a nice range of dies ordered at the trade show plus silhouette stamps from Marianne Designs and embossing folders from Leanne Creatif. It's a new month so there's different items in the Sale. If you're in the Gravesend area this Saturday, we'll be in the Gravesend Borough Market (indoors!) and we'd love to meet you. Well, I think it's fair to say that spring has arrived in Kent. It's about four weeks early but the daffodils are in full bloom already. Of course, the weather could give us another cold blast before we can say winter is really over but I'm enjoying the sunshine while it's here. Last weekend I was at the trade show in the NEC, Birmingham. It's a great opportunity to check out the products from the major suppliers and to renew acquaintances. For the moment I just have a few items to add to the website but more is on the way including new dies from a Dutch company. They should be here very soon and I'm already thinking about designs and projects for them. 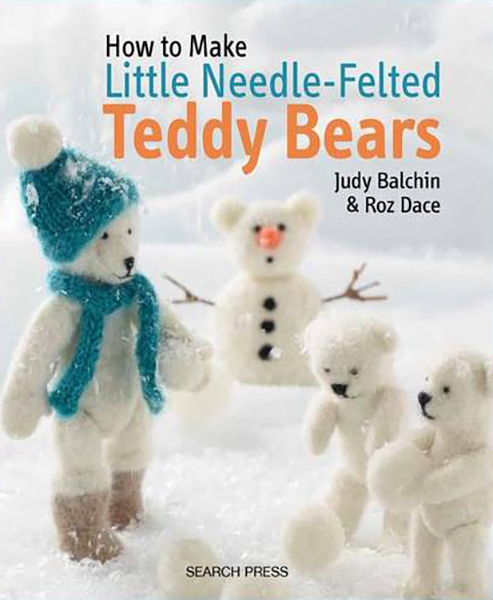 One of the crafts that are growing in popularity is needle-felting. It doesn't need a lot of equipment or space and can be quite addictive. There is something quite calming about moulding and teasing wool into the shape of a cat or bird. (Although those needles are awfully sharp). Anyway, we picked up a couple of 'How to..' books from SearchPress and these are on the website. 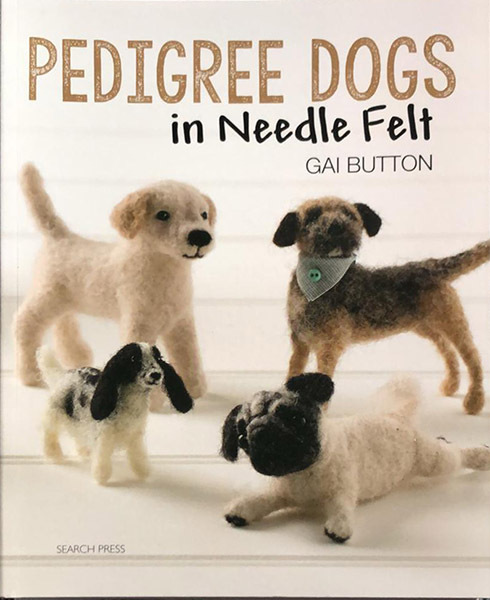 They have very clear instructions and photos and are good if you want to have a go at needle-felting or just want some ideas. 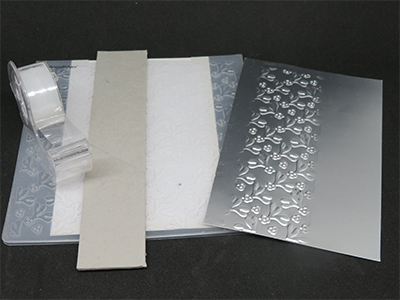 Stix2 Extra Thick Clear Acetate which can be used to make your own stencils or use as a clear card blank. Round foam pads in addition to the usual square ones. Self-adhesive hook and loop discs. The hook discs and loop discs are in separate packs so you may need to buy one of each, depending on your project. And stainless steel pins which are so useful for stoppering glue nozzles as they won't rust. On the creative side, we have some mini-stencils and beautifully detailed rubber stamps from Creative Expressions and we've added to the range of Distress Oxide Inkpads - Broken China, Chipped Sapphire, Rusty Hinge and the rather lovely Crushed Olive. A day for romance. Traditionally it was the day used to anonymously express someones secret love with a card. According to the Post Office, this is the second most busy period for them. Apparently, St Valentine is not only the patron saint of lovers but also of beekeepers and those with epilepsy. Make of that what you will. However, it would seem that he's a busy Saint. In Finland, since 1987, they began to celebrate 14th February as 'Friends Day' which is a lovely idea. No hearts for them, just cards and maybe small gifts for very close friends. Some of us do this on the first Sunday in August for "Friendship Day". Apart from the online shop, we also run workshops from our base in Gravesend and have been looking at ideas for new workshops. One that we have been working on is mini-albums and the first workshop will be on Friday 1st March, 10 am - 4 pm. One of the delights of mini-albums is being able to use many different techniques to decorate the pages. Die-cutting, stamping, stencilling, gilding, embossing and a whole range of colouring tools - mixed media heaven. The books can be very decorative or simple and elegant. Mini-albums don't just have to be used for photos. They are small memory albums, perfect for journaling, recording events, thoughts, favourite quotes or poems. In fact, anything you fancy. Standard memory album pages are 12" square and that is a large space to work with. Mini-album pages, being much smaller are less daunting and make lovely keepsakes and gifts. Following on from the stamping idea, in the last couple of blogs, I thought I would touch on the idea of combining stamps with stencils. Both of these tools are very versatile, easy to use and can be used in many different types of projects including mixed media, home decor, scrapbooking and card making. I decided to make a quick and easy card that is quite striking in its simplicity and perfect for a celebration. I mixed together Cosmic Shimmer Ultramarine glitter and clear Texture Paste which I then smoothed through a Creative Expressions A5 Stencil - Endless Bubbles onto a piece of A5 card to create the background. You can cut this down to suit the size of the card you want to use. This gives a lovely iridescent 3d effect to the card without overpowering the focal image. 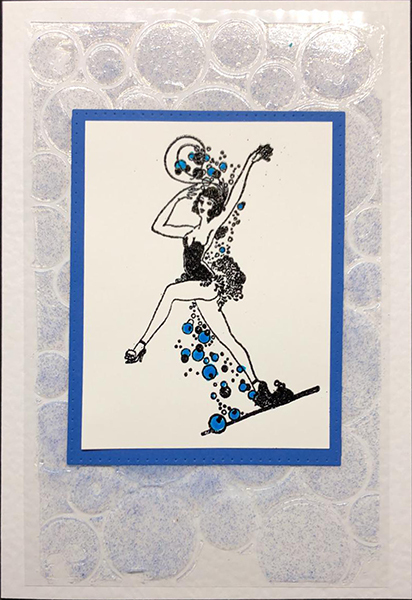 I used Versafine Onyx Black to stamp Sleek Designs stamp Dancing Girl onto a piece of white card and coloured in the bubbles. I matted the dancing girl image onto a piece of blue cardstock, matted them both onto the textured background and mounted the three layers onto a white card. In my last blog, I talked about stamping and I'm still talking about stamping! One of the effects I particularly like is splitting the image into two contrasting colours. 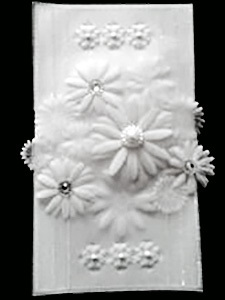 Usually, this is black and white and that's what I did with the Daisy Silhouette card below. Now the choice of a stamp would normally be one that gives a solid image rather than an outline. But I wanted to try it with something a bit fussier. So the second card uses Butterfly Flourish stamp and pink and black card instead of white and black and I'm rather pleased with the result. 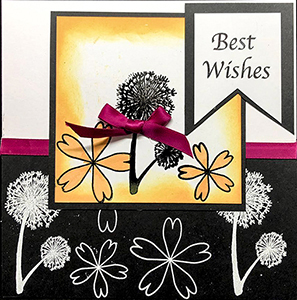 Unfortunately, since I made the card I have run out of the Butterfly Flourish stamp but you could use the Flourish Butterfly, Floral Butterfly and Background or Frilly Butterfly stamps as they are similar. Again stamp the image with Versamark, this time on pink and black card. 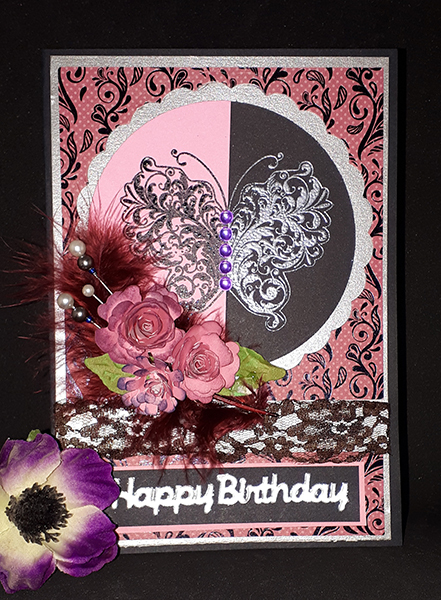 Heat emboss with WOW Primary Ebony powder on the pink card and WOW Silver Sparkle embossing powder on the black card. Finding the centre line is easy, as the image is symmetrical either side of the body. Cut both cards down the centre line and tape the two halves together from the back. Die cut the joined halves using a circle die such as First Edition Scalloped Circles. I have been a great fan of stamping for a long time. 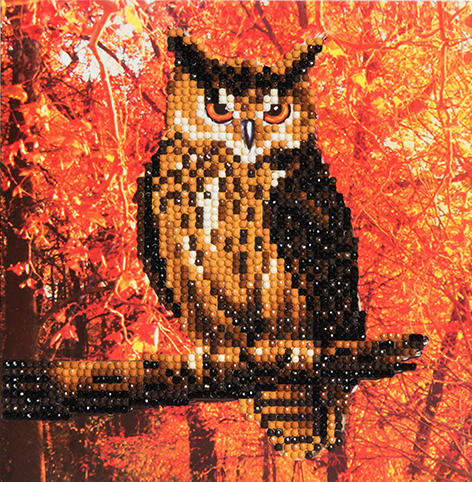 It is very easy and quick to do and is suitable for many different types and styles of crafting. I first created my own stamps back in 2005 so I could choose designs that I liked and were versatile images that I thought would be suitable for many crafters. Although it is usually quick and easy there are times when it can be frustrating if your results don't turn out the way you want them to. So I am going to give you a few pointers that have helped me get the results I wanted. These tips are mainly regarding clear unmounted stamps, also known as acrylic, polymer or photopolymer, as they are easy to use, can be accurately positioned and use up very little space when storing. However, many of the tips can be applied to rubber stamps as well. New stamps can have some residue from the manufacturing process which can cause beading of dye inks which produces blurry or incomplete images when stamping the first few times. Therefore, if you have this problem you need to 'prime' your stamps before using them. To do this you can try simply wiping the stamp with an alcohol-free wet wipe and then apply ink to them and have a couple of practice stamps until you are happy with the image. Alternatively, you can dab on some Versamark ink, wipe off most of the ink with your hand, almost massaging it off, then add your dye and stamp. You can also try the Tim Holtz method which is to swipe over a thin layer of Ranger Archival ink and leave to dry. Both the Versamark and Archival inks leave a 'protective' layer on your stamp. However, the Archival ink will discolour the stamp whereas the Versamark is clear and will not. The stamps are self-clinging so easy to mount onto an acrylic block or one of the stamping aids such as Crafts-Too Stampeazee or Press to Impress. If they lose their stickiness, rinse them in warm water with a little washing-up liquid and then dry. Do not leave them in water otherwise they could become opaque, you can guess how I know that! Most dye and pigment inks are water-based (NOT Ranger Archival or Tsukineko StazOn) so you can clean the inks off your stamp with just a wet cloth, alcohol-free wet wipe or use a Stamp Cleaning Mat and then wipe with a dry cloth. A microfibre cloth is best for drying as it will not leave any lint on the surface of your stamp or you can use a tea towel, towel or paper kitchen towel. When using a Stamp Cleaning Mat just wet the mat with tap water, rub the inked stamp over it and then dry. The mat will last for years and to clean it, rinse under the tap until the water runs clear. Then, if you have finished stamping, leave it to dry. Some inks will stain the stamp but that won't affect using the stamp with other inks. If you really don't like the discolouration then you can try to remove it with stamp cleaner. The easiest way to do this is by leaving it on the acrylic block, dabbing on the stamp cleaner and then follow the manufactures instructions for removing it. NOTE: StazOn is a solvent-based ink so won't clean off with either wet wipes or water. Tsukineko produces their own acid-free stamp cleaner for StazOn inks. Store your stamps flat and out of the light especially away from sunlight. Your work surface needs to be level and stable. Mount the stamp onto a block and place on a firm surface with the raised image facing you. Ink the stamp by dabbing/tapping the ink pad onto the stamp, not pressing the ink into the stamp. This helps you to avoid over inking the stamp, getting the ink in areas that are not part of the image or on the acrylic block. Look carefully at the surface of the image to make sure that the stamp is inked all over, especially with large and detailed stamps. Clean off any ink that may have got onto the block. Place the inked stamp straight down onto the card and without moving the stamp apply gentle pressure with your fingers or the flat of your hand over the entire stamp area. Sometimes it helps to get a better image if you are standing up. This can happen if you accidentally moved or rocked the stamp while applying pressure. When putting the stamp onto the surface hold in place while applying pressure with your other hand then lift stamp straight up off the surface. The Image is blotchy, uneven or part of the image is missing. This can happen if you use too much pressure, uneven pressure, use too much ink or your new stamp needs priming. Try to be directly over your stamp as this will help to avoid using too much or uneven pressure. Just use your fingertips rather than your whole hand, especially on smaller stamps. Standing up can also help with this problem. Make sure you apply pressure to the entire area of the stamp, be methodical when applying pressure, start at one edge and work your way across the entire stamp. Only add enough ink to apply the colour to all the lines of the stamp without pushing down on the ink pad. Over-inking applies more when using pigment inks as they have a spongy surface, whereas dye and permanent inks usually have a firm surface. Placing a pad of paper or a thin foam sheet under your surface can also help you to get a good image. 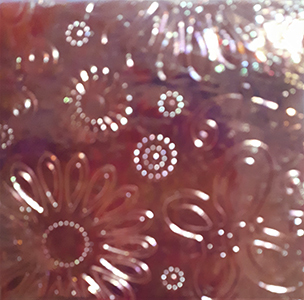 To ensure the embossing powder only sticks to the stamped image, make sure the card surface is dry and wipe the card surface with an Anti-static pad. Ink up the stamp as above using a slow drying pigment ink such as Versamark, Encore, Versacolor, Versafine or Distress Oxides. Pour the embossing powder over the image and gently tap the excess into a Clean and Tidy tray or onto a sheet of clean paper. Brush any stray powder off very carefully with a small soft brush. Use a heat tool to melt the embossing powder. Do not get too close to the paper or it will burn. Move the heat tool slowly over the entire embossed image. 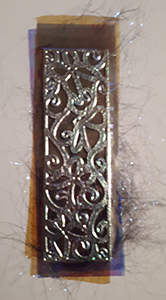 Don't wave the heat tool about as you would a hairdryer as this can move the powder before it sets and cause uneven or missing embossed areas. The embossing powder will look slightly different as soon as it is properly heated. For best results, heat from underneath the card. Heating from above can make the embossing powder spread blurring the image. If you overheat the embossing powder it will sink into the surface and will be flat instead of raised. Well, the Christmas decorations have all been put away now but it almost looks like Spring has arrived early with bright yellow Winter Jasmine in flower and the first Snowdrops showing here in Kent. Colder weather and snow is predicted but it's lovely to see these first blooms. I have been playing with Distress Oxide Ink Pads and using rather spring colours possibly slightly influenced by these first blooms. It's easy to think that Distress Oxide is just a rebranding of Distress Ink but actually they do behave quite differently. With the final release of 12 Distress Oxides last October the colour range is now complete and mirrors the colours of the original Distress Inks. There are 60 colours in the entire Distress range but one colour is included in both which is Picket Fence. Picket Fence contains both dye and pigment ink so acts like an Oxide but came out as part of the Distress Ink range rather than the Distress Oxides. A major difference between the two inks is that the Oxides are opaque whereas the Inks are translucent. 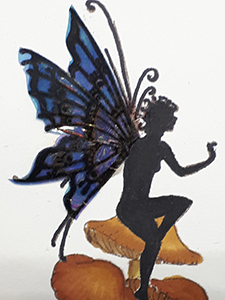 You can stamp, without adding water, with both inks, however, with Oxides you can also stamp on dark coloured cardstock and the image will be clear, detailed and beautiful whereas if you use the Inks they will not show at all as they are translucent. The Oxides are also creamier and very 'juicy' so are extremely easy to blend avoiding the need to start 'off the edge' of your card. Because of their opacity, you can also 'layer' the different colours and avoid that horrible moment when you realise that your colours just became a variation of brown. That is, of course, as long as you remember the cardinal rule - Wet colours blend and Dry colours layer. Distress Inks and Oxides are both water-reactive, Distress Inks become lighter shades of their original colour, Distress Oxides 'oxidise' which means when you add water they start to get a hazy white patina on them and start to separate into their respective qualities of dye and pigment which creates some amazing effects. Anyway, that's the science behind the two inks if you like to know that sort of stuff and here's what I found when using the Distress Oxide inks. Stamping, especially silhouette stamps gives a more solid image. They blend beautifully and smoothly using the foam applicators and retain colour well when layering colour over colour. 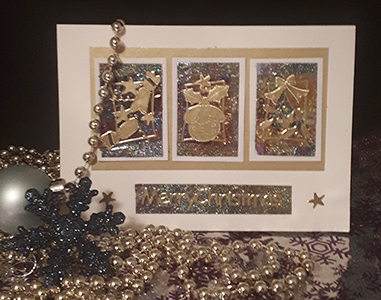 For this card from our Creativity with Stamps Workshop (the first class of 2019!) Distress Oxide was used to shade the edges of the centre panel. The same inkpad was pressed onto the craft mat and the ink picked up with a water brush to colour in the two yellow flowers. You can see how intense the resulting colours are. 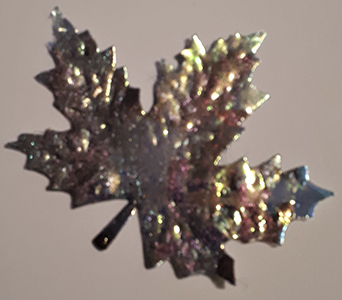 For this second card, Distress Oxide was used to create a Bokeh effect (a photographic term meaning out of focus) using both a circular sponge applicator and a finger dauber. As you can see, the spots have got a nice amount of colour in them and the edges of the spots are clear but still soft. The card was spritzed with water once the ink had dried and the result is subtly different to Distress Ink. Water drops on Distress Ink tend to bleach out the colour whereas the colour separates with the Oxides showing the hazy patina in the middle and the vibrant dye ink colour around the edge of the droplets. 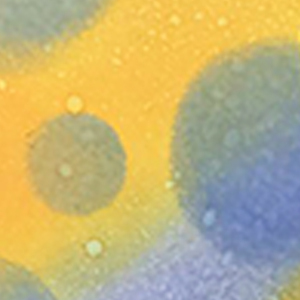 There are lots of other subtle differences between Distress Inks and Distress Oxide Inks. If you already have a good selection of Distress Inks, you may feel you don't need anymore. But I would suggest you invest in a couple of Distress Oxide Ink pads, and try them out. 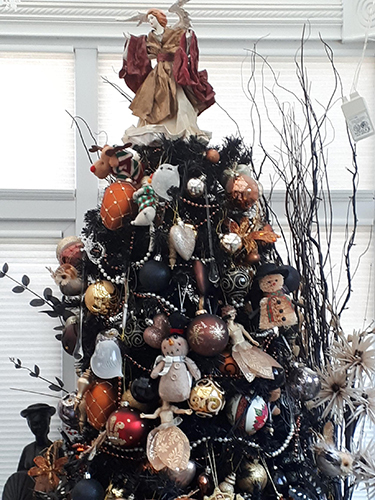 I would like to thank all our customers for their support through 2018 and wish you all the best for 2019. 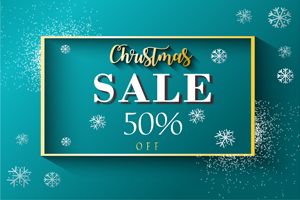 Our Christmas 50% Off sale has started today both online and in the shop. I hope you will find lots of things that you can use to speed you on your way to completing your Christmas crafting for 2019. I know, it's early but we crafters have a lot to do ;). This is the time I start to think about the workshops I will do in the coming year and I am interested in any ideas that you have about workshops you would like to attend if they were available. Therefore, I have decided that if you come up with a workshop idea that is interesting for other people too and that either I can teach or arrange for someone else to teach, then on the day the workshop goes ahead you will have a free place as a thank you from me. It's very nearly Christmas, the decorations are out and the presents wrapped. Well, most of them anyway. On the subject of presents, we use Royal Mail for shipment and our last date for orders is Wednesday 19th December for posting on Thursday 20th. Unfortunately, we cannot guarantee delivery before Christmas. Any orders received after Wednesday 19th will be posted on the next working day - Friday 28th. That's all for now, other than to wish you and yours a very happy holiday break and the very best for 2019. Last week we looked at peel-offs and in our newsletter we invited our crafty friends to send in examples of cards they had made using peel-offs which we would put on the website. Thank you to Trish who sent in three lovely cards, now so very happy to have a 'Customer Gallery'. You can get to the Customer Gallery by clicking here or go to the Home page, scroll down, and click on the box that says Customer Gallery. Now a look at another product which you may have hidden in your stash... Hot Fix Film and Fusible Angelina Fibres. Originally developed for the textile industry, Angelina Fibres are ultra-fine synthetic fibres which reflect and refract light giving a beautiful shimmering effect. Hot Fix film is the same material as Fusible Angelina fibres in a sheet instead of fine threads. Hot Fix Film and Fusible fibres can be used separately or mixed together. You'll need a hot iron, silk setting with no steam and parchment paper. Don't forget the parchment paper or baking parchment which is used to protect the fibres while heating! Tease out the fibres, single colour or a mix of colours, into a layer on a piece of parchment paper. Cover with parchment paper and heat set with a hot iron. The layer will need to be fairly thick if you want to die cut it so add more fibres and set with the iron if necessary. When die-cutting, place a piece of cardstock over the fibres on the die to help with the cut and also the release of the die cut. Layer 2 or more pieces of film, single colour or a mix of colours, on a piece of parchment paper. Lay the pieces at different angles to get the best effect. Cover with parchment paper and heat set with a hot iron. The resulting sheet can be dry embossed, die-cut or used as it is as background. Add fibres, glitter, gilding flakes, feathers or fabric scraps on top of layers of film and then lay another piece of film on top and cover with parchment paper. For this example I decided to use the Couture Creations GoPress & Foil to heat set it and then used a cutting die to emboss it rather than cut it. It was very easy to get good reults and I think very effective. However, you can of course still use an iron and the resulting sheet can be dry embossed, die cut or used as it is as background. The left hand picture is the reverse side of the right hand one. Ink up your chosen rubber stamp with Staz-On ink. Please note, although we have used our Sleek Design stamps for this process some clear polymer stamps could be damaged, or the image quality affected if doing this technique. Even if your polymer stamps appear to be ok after using we do not recommend repetitive use. Make sure the stamp is inked well then lay fibres, film or a mixture on top. Cover with parchment paper and heat set with a hot iron. You should be able to see the stamp impression when it has sufficiently bonded. The left hand picture shows stamping with fibres and the right hand one with film. Keep any scraps and trimmings as they can all be used and reused. Waste nothing! Here are a couple of images to give you an idea of what they can look like although they are exceptionally difficult to photograph as they change colour as you move them. If you have used them in the past, then you'll know what I mean. If you haven't used them before, then you are missing out on a real delight, so get some and play. Last week I talked about the latest technology for cardmaking - the GoPress & Foil, so this week I decided to go a bit retro and revisit peel-offs. Yes, that's right, peel-offs. I kept a good supply in the shop so I know they are still useful and are pleased to offer them as something of a lucky-dip clearance. For my first roll out I have Christmas themed peel-offs and here are some sample cards using peel-offs which I hope will give you some inspiration. Card #1 Bauble tree. This was from a strip of green baubles however, peel-offs can be coloured with alcohol or permanent pens. Best for this are the lighter coloured peel-offs such as silver. Card #2 Rainbow Merry Christmas - I layered the peel-off onto a piece of John Next Door double sided sticky sheet and added different coloured fine glitter. I then trimmed it, removed the backing, stuck it onto white card and mat and layered it onto gold card. 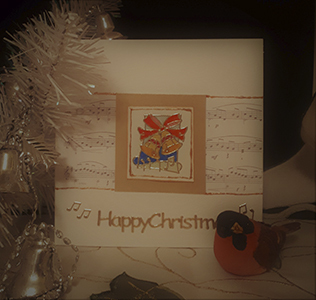 Card #3 Music bells - I stuck the peel-off onto white card and coloured it. I then used Glossy Accents to give it a shiny finish. The lines around the peel-off and each side of the music score were drawn using Creative Expressions coloured pva. Card #4 Cracker, Pudding and Mistletoe - I keep off-cuts of Fusible Film with Angelina Fibres added for texture, from my previous projects as I find them very handy. So, as they are fairly flat, I stuck the peel offs onto them then trimmed, matted and layered them onto a coloured area of my base card. As you can see the result is wonderfully unpredictable but very beautiful. I hope you have some fun trying these 'retro' ideas. I have had a lot of fun at the weekend working very hard with this foiling machine, so I can let you know how I feel about it. Actually, it was a lot of fun and I can honestly say it has been easy to use and given wonderful results with the things I have tried so far. Here are a number of things I have found out using my GoPress & Foil and my Sizzix Big Shot. The GoPress & Foil is small enough to sit comfortably on most tables at 34cm long x 17cm wide. It is 6cm high and weighs just over 1kg. It has two suction cup type feet on the bottom to keep it in place and I found it to be very stable. It has a lid!! 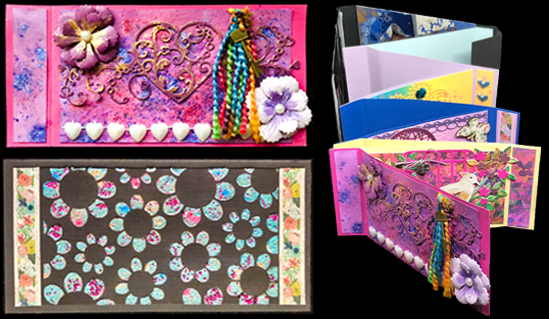 After using the GoPress & Foil I can honestly say that having a lid really made a difference especially when you are adding shims or embossing folders or layers and when moving it from the GoPress & Foil to your die cutting machine. I had mine on for quite a few hours while I was experimenting and found that the initial heat up took a few minutes, however as long as you don't leave it for more than about 30mins re-heating is quite quick. It senses the heat somehow and as soon as you add extra layers or new dies, foil etc it starts to flash a red light and starts to heat. As soon as it has reached optimum heat the light turns green and you are ready to remove the platform. There were a few times I got a little distracted doing something else while using it however, it never got too hot and never did any damage to dies, cards, embossing folders or itself. I cannot emphasise too much how important it is to experiment with the GoPress & Foil and YOUR die cutting machine. It will work in most die cutting machines with a 2.5cm gap between the rollers. This does not include Crafters Companion Gemini that has a propriety gap that is less than that. There are so many factors that affect how your machine will work with the foiling, but my suggestion is to start by using the instructions in the well written manual and if necessary, add shims of card of various weights, one at a time, until you get the best results you can. Start with small things so you aren't wasting foil. PLEASE NOTE: At no time did I use paper. I used card between 160gsm and 250gsm for foiling, embossing folders and ordinary dies which obviously affects the amount of pressure you produce when putting it through your die cutting machine. Always make sure that the plates are aligned properly on your die cutting machine and the GoPress & Foil. Never force things that don't move easily through the rollers. 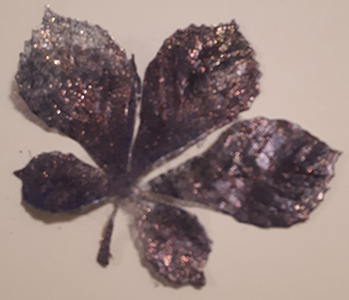 You will be surprised at how little pressure you need to foil perfectly. Too much pressure will cause foil to be put in places you do not want it to be. I started by using the Hot Foil Stamps on 175gsm card and found that I didn't need a shim to get a perfect image. Just for the sake of experimenting, I added a shim and found that I got stray foil on the card. I used a Sand Eraser that removed the excess foil easily and left no marks on the card. The images from left to right are hot foil stamp, using the waste from the previous image, using distress ink over the hot foiled stamp as the foil creates a resist, hot foil stamp with pigment ink not foiled. The next thing I really wanted to try was foiling with embossing folders. This took a little time for me to get right but in the end, I found that with 170gsm card and standard thickness embossing folders (I didn’t try any of the double sided or 3d embossing folders) I got the best results when using the thin metal shim by Couture Creations and three 200gsm shims. I got even coverage and no stray foil. Left image, embossing folder foiled, right image using distress ink after the folder was foiled as the foiling creates a resist. I then went onto using a die cut. I used 250gsm card with the side I wanted to foil on facing me, I added the foil, coloured side up, the die with the flat side against the foil then the metal shim so the cutting edge was against the metal shim and added one 200gsm shim. Once it was all heated properly, I put it through the die cutting machine. Do remember to go very slowly. I removed the foil, turned the die over and aligned it with the card with the cutting edge down. I found this easy to do as the card had also been debossed and the die just slipped into the debossed, foiled shape. This meant that with the die I was using the cutting edge was in the middle of the foiled edges. Then I die cut it as I would any other die using my die cutting machine and plates, not the GoPress & Foil. The benefit of foiling the flat edge first is that you get the inner edge of the die foiled and the outer edge, so you have both a foiled die cut and a frame. This was just a simple square frame but you can see the left hand image is the part you would normally use and the right hand image is the part that often gets thrown away. Here are three cards made using the above techniques. 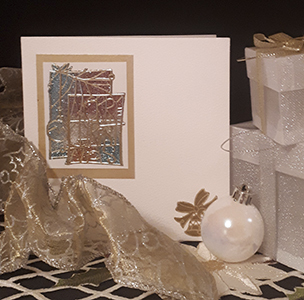 The left hand card uses the foiled embossing folder, hot foil stamp greeting and surrounding the greeting a hot foiled die cut. 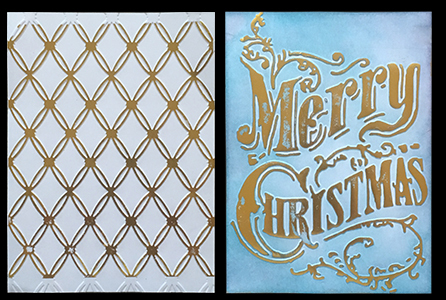 The middle image uses a foiled embossing folder surrounding the greeting and hot foiled stamp greeting. 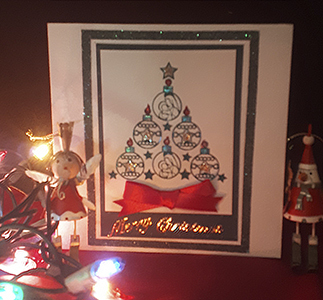 The Christmas card just uses a foiled die cut from red metallic card behind the Happy Christmas greeting. That's all for now, I am off to try some of the other techniques, hope you find this useful. When browsing our website we have tried to make it as simple as possible for you to find what you want, so here are a few tips. From the front page you can click on any of the Main Menu links and it will take you to a page that shows every category or product in that menu item. 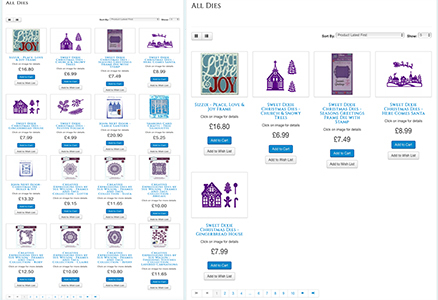 For example if you click on Stamping in the Main Menu a new page will open showing all the categories in stamping - Sleek Designs Stamps, Sue Wilson Stamps, Woodware Stamps, Crafters Companion Stamps, Colouring Pens, Ink Pads and Stamping Accessories. You can then click on any of those categories to see the products within them or further categories. You will notice that the Stamping menu item is highlighted in Blue. However, If you know you want to look at Sleek Designs stamps then you can hover with your mouse button over the word Stamping and a drop down box will show a list of categories and you can simply click on the one you want and it will take you to that page. If you know what product you want to look for you can use the search at the top of the website. Just enter a word or words that you are looking for and click on the magnifying glass or hit enter on your keyboard and the search result will appear on a new page with products that have the word/s you entered in its title or description. When you click on a category, for example Die Cutting and Embossing and look above the category title you will see a red arrow on the left and right of the page with another name next to it. When on Die Cutting and Embossing you will see a red arrow with Decoupage next to it on the left hand side and a red arrow with the words Sale Items next to it on the right hand side. If you click on either of the arrows you will be taken to the next page of categories. This allows you to easily move through different categories quickly without having to keep going back to the main menu. When you click on a product within a category, for example if we were in the Craft Workshops category, and you clicked on the Christmas Wreath workshop you will be taken to the information regarding the workshop and on the right hand side above the title you will see a red arrow with Christmas Lantern next to it. You can click on that arrow and go to the next workshop and so on until you get to the end of the workshops. At any time you can click on the Sharon’s Card Crafts logo on the top left of the page and you will go back to the front page of the website. When you are within a category with products for example “All Dies” from the Die Cutting and Embossing category you will see the red arrows on either side of the page and below the title of All Dies you will see two icons on the left hand side one with little boxes in it and one with a dot and some lines. These two boxes allow you to look at the products in either a grid format (default-little boxes) with the information below the item or the icon with the dot and line allow you to look at the products in a list with the information to the side of the product. On the right hand side there is a box that says Sort By. This allows yo to choose how you would like the products to be arranged. The default is Newest First but you can also choose to sort by Oldest First, Product Price High to Low or Low to High and Product Name A-Z or Z-A. The furthest right box has a number in it (5) this allows you to pick the number of products you want to see on each page, the default if you don’t change it is 16 items but you can choose from 5 to all products. This allows you to pick the number of items you can see on a page before you either have to scroll down or move to the next page. When you look at the products on the page you can add items to your basket from there or if you would like to see more about it then click on the image and it will take you to a page with more information, any other pictures or samples of the product and sometimes related products and reviews. If you hover your arrow over the picture it will zoom in and make it bigger for you. I hope this helps you to move quickly around our site and easily find the products you want to see. Ribbons..... they make such a difference to the finished look of a card or other project. Although they are often used as a finishing touch they can be used in many different ways. Here is a "before and after" and you can see the difference a strip of ribbon makes to this simple greeting card. Organza - A sheer see-through ribbon, sometimes satin edged, can be plain or patterned and comes in lots of colours and widths. It can be used in many of the same ways as satin ribbon and making flowers from it is very easy as it is slightly stiffened and holds it's shape well. Grosgrain - a ribbed ribbon, plain or patterned that has a certain amount of elasticity. I think these are particularly cheerful, fun ribbons. Tulle - soft net used in veils and so on. Make a loop, hold between the finger and thumb of your left hand, with the tail to the front. Wrap the other end clockwise around the loop to form a band. Make a second loop with the ribbon in your right hand and push it through the band. Begin to pull the loops to tighten. Adjust the size of the loops etc by alternatively pulling the tails then the loops. If the ribbon is patterned on one side, fold the ribbon over when you take it around the first loop at stage 2. If you still don't like your bows or you have a lot to make then investing in a bow maker is probably a worthwhile spend as it helps to make bow making easy and quick. Ribbon can be secured with double sided tape, of which I prefer redline tape which is very strong, glue, make sure it dries clear, glue dots or decoratively with brads, eyelets or pins. Large bows may need a bit more help to stay in place for which silicone glue is a particular favourite of mine or you can use a hot glue gun (with hot glue) on satins and grosgrain but check before using it with organza or tulle. Apart from making bows ribbons can be woven, twisted, plaited, folded, pleated and twirled. They can be an embellishment or something practical such as the stop on an easel card or they can be the design of the card itself. There are many, many ways to use ribbon to add interest to projects. Have fun exploring the possibilities. Since my last blog, I have been reminded about using diffusers to emboss just selected parts of a card. If you haven't tried this, here's what it is and how it works. Embossing folders are perfect for adding texture and interest to your card, but you may not want the whole card embossed. A diffuser is a piece of plastic or thick card that concentrates the die machine's roller pressure onto just part of the embossing folder. Place a diffuser on top of part of the embossing folder and the folder will only emboss the area covered by the diffuser. There are plastic diffusers on the market but it's easy to make your own from thick card, the kind that you get on the back of note pads. To get a single stripe of embossing, I placed my cardstock in the folder and secured a piece of card to the top of the folder where I wanted the embossing. I adjusted the depth of the plate stack for my die cutting machine and ran it through without the bottom plate. As you can see, only the area covered by the diffuser has been embossed. Then I cut a piece of thick card so that the middle diamond would be plain, then used the square I cut out to emboss just the middle of the card. I then placed some offcuts diagonally, to create stripes. This card it too thick to die cut so if you wanted a particular shape, you can die cut several layers and glue them together to get the thickness you need. You will need to experiment with your own machine to find the combination of base plates that works for you. 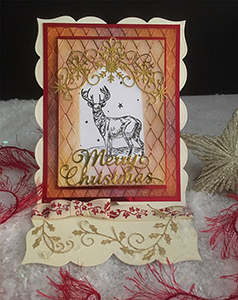 Here is a card made with the diffuser technque and Sleek Designs reindeer scene stamp, part of the Impression Obsession die Merry Tree and Distress Inks to colour the area that was embossed with the diffuser. New this week, we have Izink dye-based ink pads. The inkpads are water- based and clean easily off of stamps and embossing folders etc. They are a handy size, and a very handy price! They are water based and acid free so perfect for scrapbooking, stamping, mixed media and journaling and many other crafts. You may have seen our selection of John Next Door cut and emboss folders. 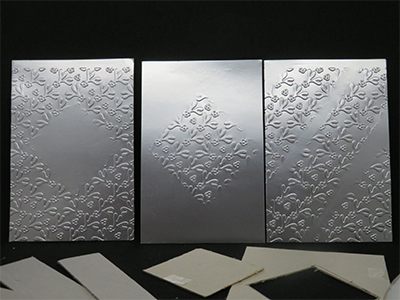 We are used to cutting dies which will also emboss but these are embossing folders that incorporate a cutting die. One of the challenges with embossing folders is cutting an apperture into your beautifully embossed cardstock. If you emboss and then diecut, the embossing gets flattened down. If you diecut and then emboss, the edge around the diecut tends to be ragged. These cut and emboss folders are designed to give you a perfect finish with appertures beautifully integrated into the embossed design. Lastly, our sale started on Monday. We’ve been busy this week. 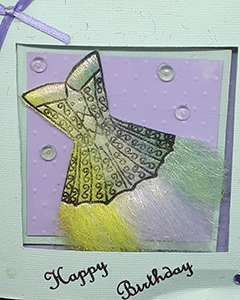 We had a stamping workshop last Monday and had lots of fun creating cards with the new stamps from Woodware using embossing powders, Luna Paste, Colour Cloud Blending Ink, Mist Sprays and Crackle Paste. It was a delight using the Crackle Paste and easy to use so, of course, I got some more in, with wonderful names to match their beautiful subtle shades like Frosted Aqua and Victorian Rose. But the big news is, the latest shipment of dies we received direct from the manufacturers has arrived. 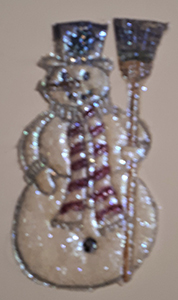 18 designs in all, lots of choices especially for the Festive Season, including three snowman designs. I don’t think you can have too many snowmen. However, if you are someone who has all your Christmas crafting already done then we have others that would be perfect for any time of the year such as Star Background, Lattice Frame & Butterflies, a delicate Floral Mandala and a Maple Leaf Frame. Lastly, we have restocked the EZMount for the unmounted rubber stamps and we have the Crafter Companion ScoreMaster Board. The Scoremaster Board is large enough for A4 card and the score lines are just 1/8th inch apart on one side of the board or 5mm on the other for those who prefer metric. One of the nice things about having a shop that sells things I really like (that's craft stuff, not shoes) is that I get to work with and learn how to get the best from wonderful products. Then, when I am teaching workshops, I get the opportunity to share all the things I have learnt about them with others who share the same enthusiasm for crafting. It's still a job and there are lots of things that I wish I didn't have to do but I think that I am lucky to have a job that mostly I enjoy. Anyway, on to the super new products we have had in this week that I had fun working with. 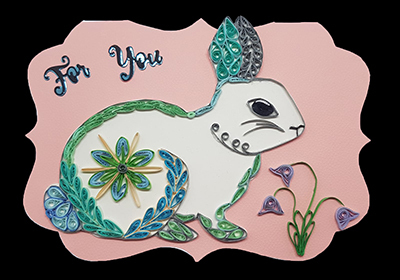 For all fans of die-cutting, like me, we have some beautiful dies in from the Creative Expressions Festive Frame collection and although they are called Festive, some of them could be used all through the year. We have the gorgeous paper cuts dies, Foliage Frame, Poinsettia Edger and Holly Berry Edger that add wonderful dimension to any card, whether elaborate or super simple. We also have stunning Frame dies, Natalie, Faith, Eve, the very cute Overlay and Ornament and the ever useful Season's Greetings. As a stamping enthusiast, the delivery I was particularly excited about was the stencils and stamps designed by Francoise Read and inspired by the art of India. You will see that we have added to our range of colouring products with ...deep breath...Cosmic Shimmer Crackle Paste, Embossing Powders, Luna Paste, Colour Cloud Blending Ink and Mist Sprays, all in gorgeous colours too. If you enjoy creating textures and layers and exploring different techniques and effects you will love these. 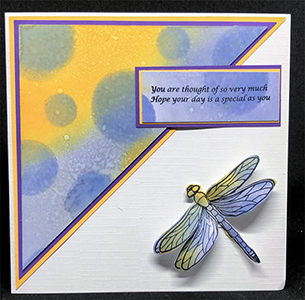 The possibilities with these dies, stamps and texture and colouring mediums are endless and you can create different and unique looks each time. It's now two months since we moved from our shop in Swanley - time flies. We are still fine tuning things on the website, however, the workshops are up and running in Gravesend and people seem to be finding them very enjoyable. 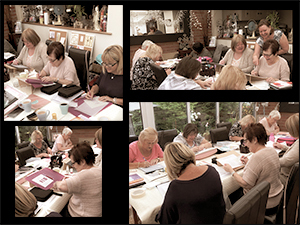 All the information regarding workshops for the next couple of months are available to see by either the Craft Workshops link in the main menu or the month picture located on the right hand side of the Home page. So if you are interested in having a good time, learning something new, creating something beautiful and maybe meeting new like minded people then why not take a look and see if there is something that piques your interest. I am really pleased to say that we are now coming to another milestone in our website venture which is our first website sale! Our aim is to have a sale posted on the last Monday of every month that will have completely different items to the previous month. 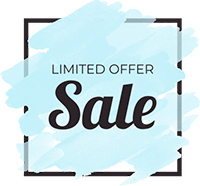 They will only be available that week and/or while stock lasts so look out on Monday 24th for the Sale link in the Main Menu on the front page of the website. I hope you like this idea and that you will get a chance to grab some of these bargains. We have noticed that out of all the crafting items available these days, that dies still seem to be one of the most popular. They get used in many different craft projects from cards, mixed media, scrapbooking, 3d projects even to decoupage on furniture. They truly are an extremely versatile medium, however, as much as we love them it appears that very many of us have the same pet peeve. What, I here you ask, is that? It is that when it comes to getting our die cuts out of some exquisitely detailed dies we can have a problem getting them out in one piece or even getting them out at all. Obviously this is extremely frustrating but even more so when we have used the last piece of a particular card or paper that we wanted to use! The answer we found that worked best for us is not to just throw the die out of the window in a fit of rage but to use Wax Paper with the die. Now before you all run off and dig out the greaseproof paper from the bottom of the darkest depths of the baking cupboard in your kitchen, I am afraid I have to let you know that it is not the same thing and will not work the way the waxed paper does. Here is the science - greaseproof, baking and baking parchment papers are all heat-resistant, non-stick surfaces specially developed for baking on. Please note in particular that they are heat-resistant and therefore won’t catch fire in your oven! Waxed paper, on the other hand, is exactly what is says in the name, it is coated on both sides with wax, probably not the nicest addition to your beautiful pavlova or scones. However, when using with a die and paper/card both the die and the paper/card are slightly affected by the wax coating which makes the die cut easy to remove from the die, which is all that we really want in the first place! I know some people will say, oh but it’s just another expense but remember that you can usually leave the same piece of waxed paper in the die and use it a few times before it needs replacing. Most intricate dies are not as big as baking sheets and most importantly they relieve you from the stress, time and cost of having to do the die cut again. Sit back and remove the beautiful die cut from the die and enjoy making your project. We've taken a little break from Christmas themes this week, because we still need birthday, thank you, congratulations and get well cards etc. Our new product this week is the beautiful range of floral stamps designed by Stacey Barrass for Crafters Companion. They have a lovely hand drawn quality with a lot of detail and lend themselves to so many techniques. With different techniques and colours choices can give you very different looks of cards even when using the same stamp set increasing the usefulness. Male cards are often not made with floral images but there are many men that like gardening and flowers so why not give it a try. You can try a monochrome colour scheme, using Memento Gray Flannel or Rich Cocoa or Spectrum Noir Graphic pen set Cityscape with it's masculine colour sceme and very uselful neutrals or how about fully coloured images using Spectrum Noir Graphic pen set Tints and pair it with one of the sentiments such as 'You are amazing', 'Thank you', Thinking of you' or how about 'Live life your way', one of my favourites. For a Christmas card, stamp with Versamark and heat emboss with Wow Gold Rich Pale superfine embossing powderr and colour with the deep, opulent colours of Christmas or you could go for a white, frosty theme by heat embossing with Wow Metallic Silver Sparkle or Pearlescent White Pearl superfine embossing powder and use pale blues just to provide a hint of colour. How could anyone resist! We have more of the Foam on a Rolll back in stock and also some A4 sheets of double sided foam. In last weeks blog post we gave you some ideas about how to mount these stamps and you may notice that we have run out of Ezmount, although more is comong in, however, in the meantime we do have Stix2 Mount n Stamp. It's official, this summer was the hottest on record and finished with a lovely Indian Summer this week. But being crafters, our thoughts are on the Christmas holiday season. 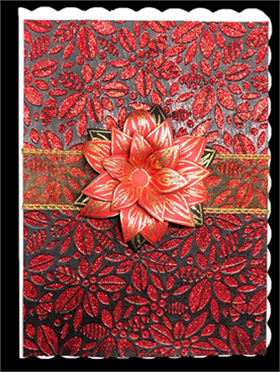 So we have added Sheena Douglass Festive Embossing Folders and unmounted rubber stamps designed by Donna Ratcliff. These rubber stamps are a departure from the traditional snowman and Santa. I think of them as showing how the elves and fairies celebrate Christmas and would be fun cards for both adults and children. We also have both EZmount and Stix2 Mount n' Stamp foam in stock for attaching the stamps to acrylic blocks. If you haven't used unmounted rubber stamps before, here are a few tips which might be helpful. The stamps come on a sheet and you cut the individual stamps out and attach them to a rigid surface. A wooden block, acrylic block or stamp press/positioner etc. You can use double sided tape, but make sure it's not too sticky or it could be difficult to remove from the block. Stick and Spray is a spray adhesive which can be used to hold stencils in place as well as rubber stamps. And finally, EZmount and Mount n' Stamp which have an adhesive side to stick to the back of the stamp and a clingy side that will hold temporarily to your block. If you are using EZmount or Mount n' Stamp, then attach the mount foam before you cut out the stamps. Cut the sheet of mount to the right size, peel off the backing on the sticky side and fix the sheet of stamps to it. Now take a pair of sharp scissors with a good point and cut around each stamp. Hold the scissors at a right angle to the stamp so that the cuts don't slant into the stamp. Follow the shape of the stamp as close as you can without actually cutting into the stamp. This will reduce the risk of getting ink around the stamp and will help to position the stamp on your card. Now peel off the other side of the mount. You might find it helpful to put a small mark or arrow on the back to show which way up the stamp image should be. Especially helpful with text. One of the challenges with rubber stamps is positioning them as you can't see the image. This is where one of the stamp positioners such as Stampeazee is so helpful by using it the opposite way. Place the cardstock on your work surface and place the acrylic plate of the positioner over it, top side down. Now arrange the stamps on the acrylic plate so that the image is facing you. Reposition the cardstock, ink the stamps and stamp. 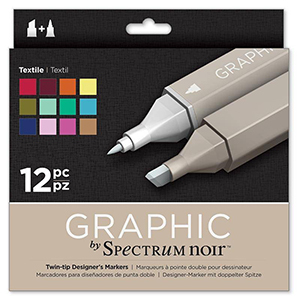 We now have the wonderful Spectrum Noir Graphic pens in stock and at a brilliant price! £19.99 for packs of 12 pens (rrp £24.99) and £10.99 for packs of 6 pens (rrp £12.99). These alcohol pens blend and layer beautifully. I love colouring and these pens provide a range of colours that make it so easy, and fun, to add shading and tone. Foam pads come in different thicknesses as well as different sized pads, we have Payper Box in 1mm and 2mm thicknesses and Crafters Companion in 3mm thickness. 1mm is nice when you don't want too much height, such as decoupage where each layer sits just above the one below to give a 3D effect. 2mm thickness is a good general purpose pad that works well for mounting a topper or sentiment panel. Then there is the chunkier 3mm pads which we have in larger 12mm x 6mm and 24mm x 12mm. 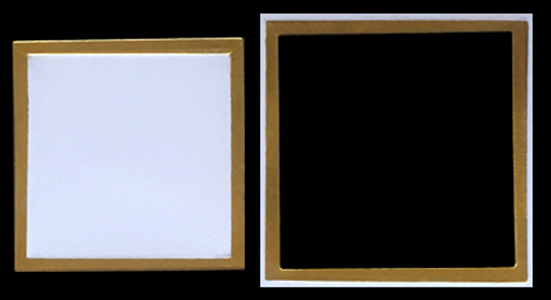 These are perfect for when you want to make more of a statement, perhaps for a frame. The Foam on a Roll has a thickness of 2mm, width 10mm and a length of 2m, giving a lot of tape for the price. It can be cut into smallish pieces (but don't use your best scissors for that) or it can be left as longer strips giving more support. Perhaps it's the flexibility which makes it appealing. However, if you are looking for flexibility, then we shouldn't forget silicone gel. Ideal for decoupage and fine detailed die-cuts, for giving a bit of support to the raised wings of butterflies or the petals of flowers and great for securing buttons and bows! Hope you found that interesting, be back soon. Well the heatwave finally ended and just in time for our first workshop in our new venue. It certainly makes it a lot easier to work without electric fans blowing paper about! Lynn's Parchment workshop went very well and I'm delighted to say that we got a thumbs up from everyone. Although the space is smaller than we had in the shop, there is plenty of natural light which is so good for crafting and makes it a lot easier on the eyes. As we are talking about Parchment Craft I am pleased to say the we have some lovely Christmas themed Groovi Boards just in and Darwi Ink - in gold, of course. We also have something for die-cutting fans. We have sourced some lovely dies direct from the manufacturers that we found to be good quality and they are a good price, we hope you will like them too. That's all for now, I'll be back in blogland soon. We had a few hiccups when the website when live on Friday. Apparently that is quite normal and who am I to argue with the ‘experts’. Everything seems to be ok and we are still adding to it so please keep checking both the Inspiration and this Blog page. Anyway, I am very pleased with the feedback that I have been getting that people like the overall look of the site and are finding it easy to navigate. I am looking forward to our first workshop on Thursday 16th which is parchment crafting with Lynn. The workshop runs from 10am - 4pm with 1 hour for lunch, which we supply. You can see all our upcoming lessons by clicking on the pictures on the side of the home page or on Workshop Booking in the Crafting Workshops menu. That’s all for now, be back soon.